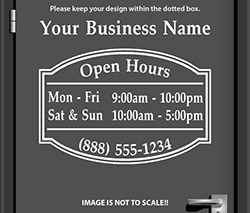 Because these are tailor made for each and every customer, sometimes the design may not fit a pre-determined size. Whichever size you choose, that length will apply to the longest side, e.g. if you choose 12", this means that your longest side (which maybe the height or width) will be 12". One of the options you can select is to receive a design proof. 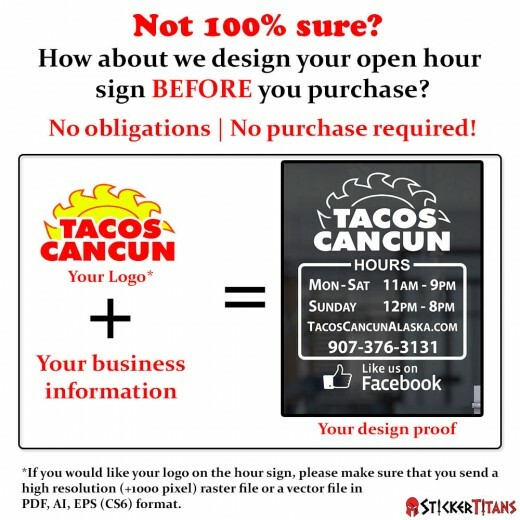 Once you place the order, our designers will take your information and manually create a design proof for your approval. 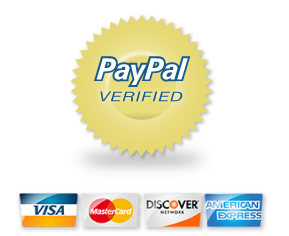 Because of the infinite number of variations possible with these custom signs, the website will not produce a proof automatically. 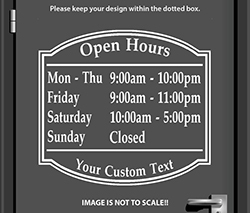 We will send this design proof via an email. Please note that you are responsible for replying and approving the proof. We will NOT start production before we receive this approval (if you select YES). As you can see above, there are many colors to select from. White is by far the most popular color because it stands out the most on glass windows (tinted or un-tinted). 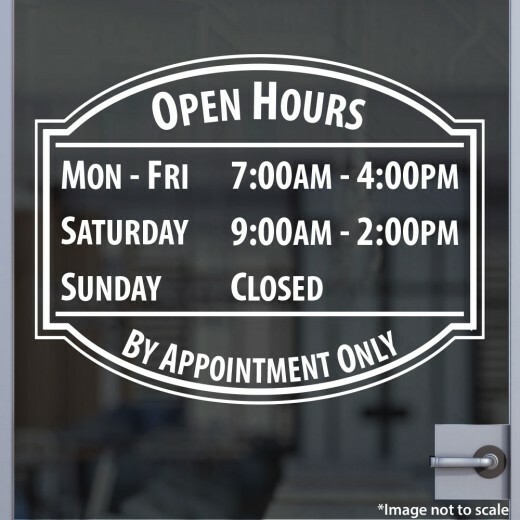 If you are planning to place your signage on the inside face of the glass door, you MUST let us know to reverse the image. 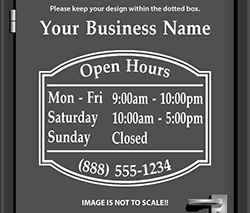 By default, we will assume that your sign will go on the OUTSIDE face of the door. 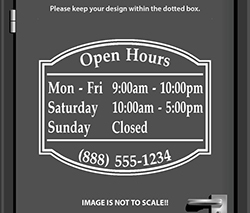 On metallic, plastic, or painted wood surfaces, the color you choose should have the greatest contrast against the background so that the signage will pop. Adhesive: Solvent based permanent - PERFECT INDOORS / OUTDOORS! 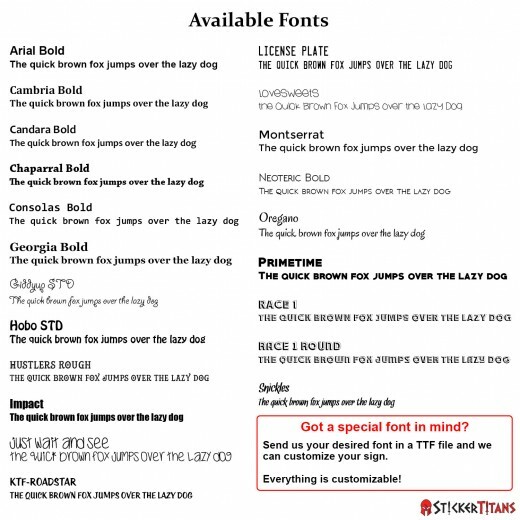 Application: Originally designed for fleet vehicle graphics. Perfect choice for cars, trucks, and windows! 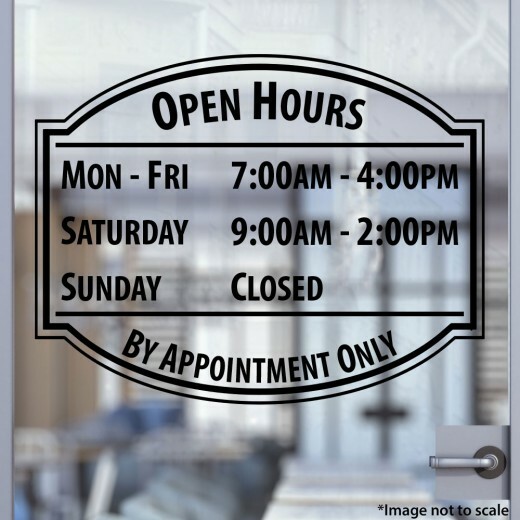 Instead of a digital printer applying INK or PIGMENT onto a sheet of vinyl, die-cut stickers (or more aptly kiss-cut stickers) are already colored rolls of vinyl adhesive material. 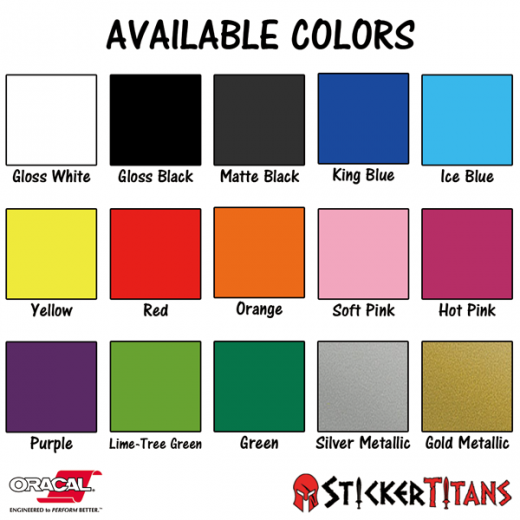 These vinyl rolls comes in numerous colors, but at StickerTitans, we currently carry 15 different hues. 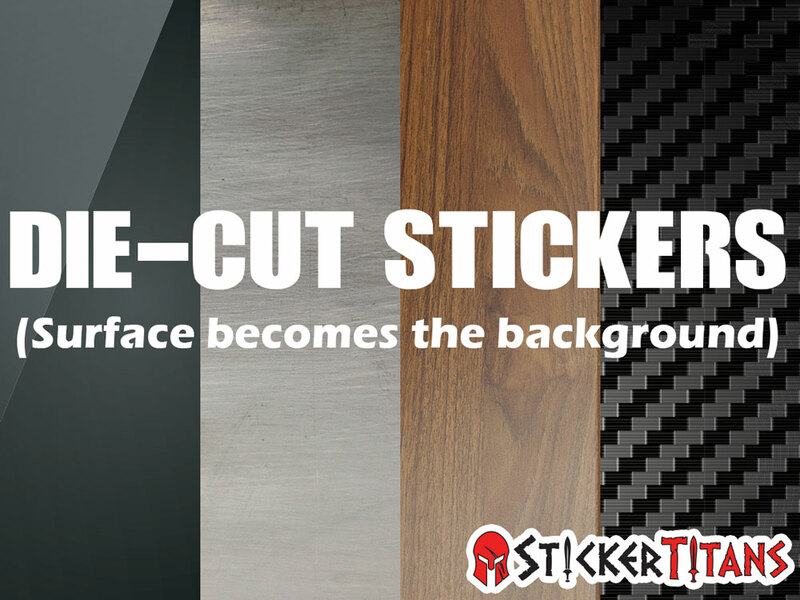 Our decals are cut with a precision vinyl cutting machine, into the shape of the sticker. A transfer tape is applied on top of the decal, to keep the individual parts of the sticker intact during application. The transfer tape is removed after installation, leaving only the letters and graphics on the installed surface. Because the background is the surface that the stickers are applied to, we recommend that you choose a vinyl color that contrasts the application surface. For instance, if you are purchasing our rear glass decals, the most visible vinyl color would be white, as your rear window is tinted from factory. 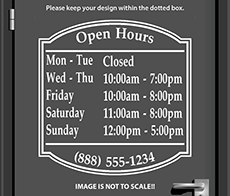 Instead of placing these decals onto your glass, if you are planning to place it on the rear of your white box truck or trailer, the more appropriate color would be black or blue. If you have any questions regarding colors, please give us a call at 470-585-2229. Unless otherwise noted, your item will be shipped from Atlanta, GA via USPS 1st Class Mail within 1~4 business days of payment receipt*. Please note that the below map should be used as a general reference and that USPS does not guarantee the delivery time for its First Class or USPS Priority Services. 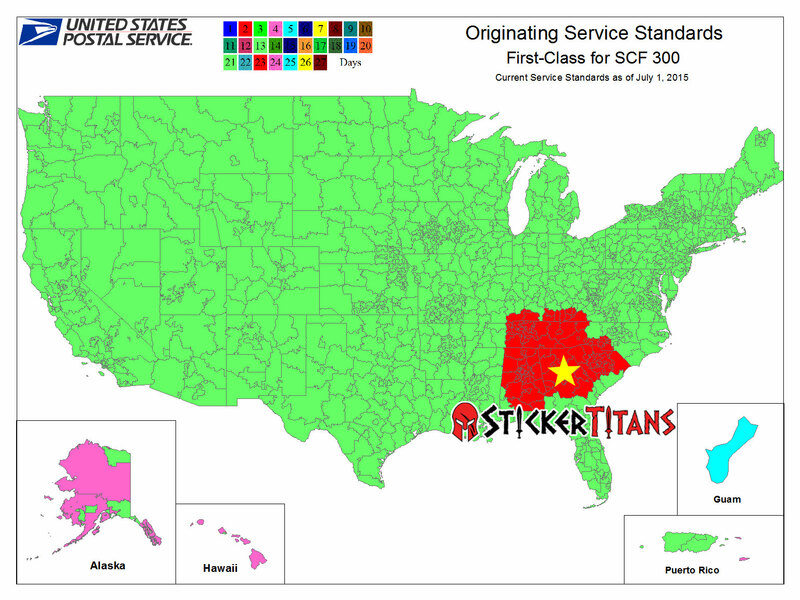 If you have any questions regarding your shipping, please email us at sales@stickertitans.com. * Holidays and Weekends excluded.Also excluding custom items that require proof approval. 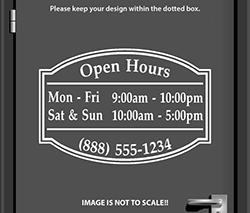 If you would like us to design a proof before you purchase, click here. 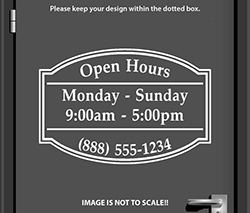 Popup Banners Full Color Print and Stands 33" x 79"